[178 Pages Report] The Blockchain as a Service Market comprises Blockchain as a Service platform vendors and service providers. Platform providers are vendors who provide back-end infrastructure and development tools-as-a service to application and solution developers at an individual or enterprise scale. Service providers are vendors who provide advisory and consulting, custom development, system implementation and integration services, and managed services to end-users. The market size was valued at USD 350.0 Million in 2017 and expected to reach USD 15,455.0 Million by 2023, at a Compound Annual Growth Rate (CAGR) of 90.1% during the forecast period. The year 2017 is considered as the base year, while the forecast period is considered from 2018 to 2023. The objective of the report is to define, describe, and forecast the market trends based on components, business applications, organization size, industry, and region. The objective is to provide detailed information related to the major factors, such as drivers, restraints, opportunities, and challenges, influencing the market growth. The Blockchain as a Service ecosystem comprises vendors, such as IBM (US), Microsoft (US), Oracle (US), SAP (Germany), Waves Platform (Russia), HPE (US), Baidu (China), Stratis (UK), AWS (US), Huawei (China), KPMG (Netherlands), Accenture (Ireland), PwC (UK), Infosys (India), TCS (India), TO THE NEW (India), Capgemini (France), Deloitte (US), Cognizant (US), EY (UK), NTT Data (Japan), ConsenSys (US), Wipro (India), L&T Infotech (India), and Mphasis (India). The study answers several questions for stakeholders; primarily, which market segments to focus on in the next 2 to 5 years for prioritizing their efforts and investments. 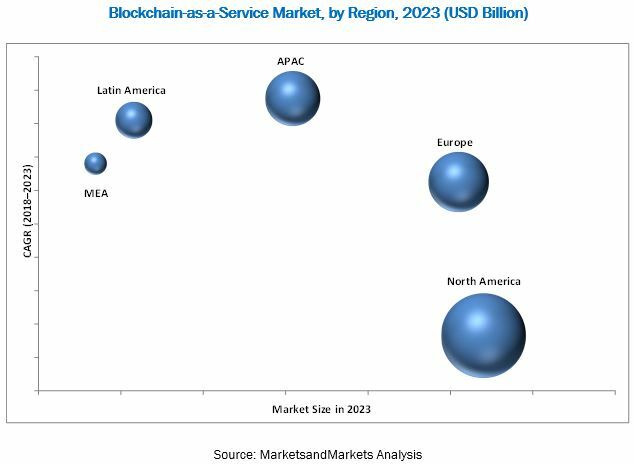 The Blockchain as a Service market is expected to grow from USD 623.0 Million in 2018 to USD 15,455.0 Million by 2023, at a Compound Annual Growth Rate (CAGR) of 90.1% during the forecast period. The major growth drivers of the Market include the low cost of bandwidth, data storage, and computing, and need to lower risks, complexities, and increase efficiency. The Blockchain as a Service Market has been segmented on the basis of components into tools and services. The services segment is expected to hold the larger market share during the forecast period. The demand for consulting and implementation services is expected to surge, due to the growing need for Blockchain as a Service solutions across organizations. Major Blockchain as a Service business applications include supply chain management, payments, identity management, smart contracts, and Governance, Risk, and Compliance (GRC) management. The adoption of Blockchain as a Service offerings for the identity management business application is expected to increase significantly in the coming years. The unavailability of equivalent systems for securing the identity of digital entities and online authentication of personal identities are expected to increase the adoption of the blockchain technology. The integration of the blockchain technology provides a solution to mitigate the need for central authority and trusted third parties. The Banking, Financial Services, and Insurance (BFSI) industry is estimated to hold the largest share of the Blockchain as a Service Market in 2018. Organizations in this industry are leveraging the benefits of decentralization, immutability, efficiency, cost-effectiveness, and security, which are expected to increase the adoption of the blockchain technology across the BFSI industry. The manufacturing industry is expected to grow at the highest CAGR during the forecast period. The global market has been segmented on the basis of regions into North America, Europe, Asia Pacific (APAC), Latin America, and Middle East and Africa (MEA). The North American region followed by Europe is expected to continue as the largest revenue-generating region for Blockchain as a Service vendors for the next 5 years. This is mainly because, in the developed economies of the US and Canada, there is a high focus on innovations obtained from Research and Development (R&D) and technologies. While the APAC region is expected to be the fastest-growing region in the Blockchain as a Service market due to the increasing adoption of the blockchain technology. The Blockchain as a Service Market faces challenges such as the lack of standards and best practices, and low awareness and understanding of Blockchain as a Service tools and services. Factor such as uncertain regulatory and compliance environment is expected to limit the market growth. The major vendors that offer Blockchain as a Service tools and services globally include IBM (US), Microsoft (US), Oracle (US), SAP (Germany), Waves Platform (Russia), HPE (US), Baidu (China), Stratis (UK), AWS (US), Huawei (China), KPMG (Netherlands), Accenture (Ireland), PwC (UK), Infosys (India), TCS (India), TO THE NEW (India), Capgemini (France), Deloitte (US), Cognizant (US), EY (UK), NTT Data (Japan), ConsenSys (US), Wipro (India), L&T Infotech (India), and Mphasis (India). 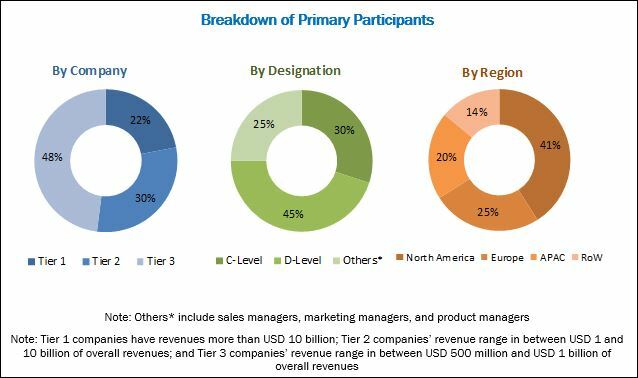 These vendors have adopted different types of organic and inorganic growth strategies, such as new product launches, product upgradations, partnerships, collaborations, agreements, and acquisitions, to expand their offerings in the Blockchain as a Service Market.